Hybrid electric bikes is a confusion term inside the electric bicycle world. 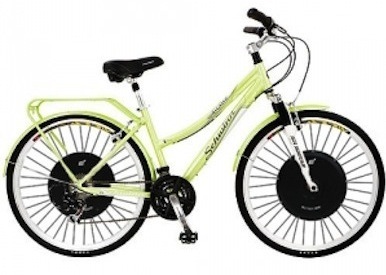 One definitions says that hybrid electric bikes refer to a combination of motor and pedaling. This kind of definition can relate to any one of the electric bicycle types in the types page. The other definition says that this type of bike is a combination between mountain and road bikes. And that is the definition that this page is related to. So a hybrid bike is a compromise between this two different worlds. They are built for the city commuter and as such, each component is selected to offer the best result for this environment. For example, the hybrid bicycle wheels are much wider then a road bike wheels, they resemble a mountain bike wheels. This gives the bike stability and durability. 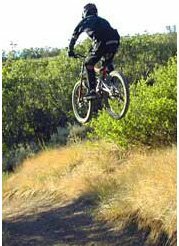 But, the hybrid bike wheels have much higher air pressure that mountain bikes. The higher air pressure allows the bike to go faster by reducing rolling resistance. To read further about hybrid bikes, click here. The hybrid bikes are for city commuter. For people who want to get from point A to point B in the most convenient way. But what does it mean, the most convenient way? One person can be in a hurry so he just want to reach his destination as fast as possible and the other person just want to relax and enjoy the ride, he doesn't want to push himself to the limits and he doesn't want to get too sweaty. For both of them, an electric hybrid bikes can be a good solution. By choosing the right level of assistance, each person is benefited. You can reach your destination faster then with just pedaling if you want to, and you can choose to use the assistance for only steep hills if you just want a pleasant, sweating free, ride. This is why I think that pedelecs are more appropriate when talking about hybrid e-bikes in comparison with throttle e-bikes.